What You Need To Know: In the first inning, Yu Darvish threw 39 pitches all over the place, and it looked like it was going to be a long day in every sense except for his innings pitched. But then, he actually settled down! (*Extreme Al Michaels voice*) Do you believe in miracles?! YES! After escaping that jam down only 1-0, Kyle Schwarber and Javy Baez went back-to-back to give the Cubs a 3-1 lead, and they never gave it back. Baez put together three hits and an unofficial save, pulling Schwarber away from home plate umpire John Tumpane, who combined a clueless zone with an extreme sensitivity and ejected Schwarber after he had the gall to say “that was up” on a bad strike three call. Hopefully, Tumpane is able to emotionally recover after such abuse. Anyway, if nothing else, the post-ejection action just adds to the rapidly growing collection of “Baez Schwarber hug gifs,” and that’s fun. 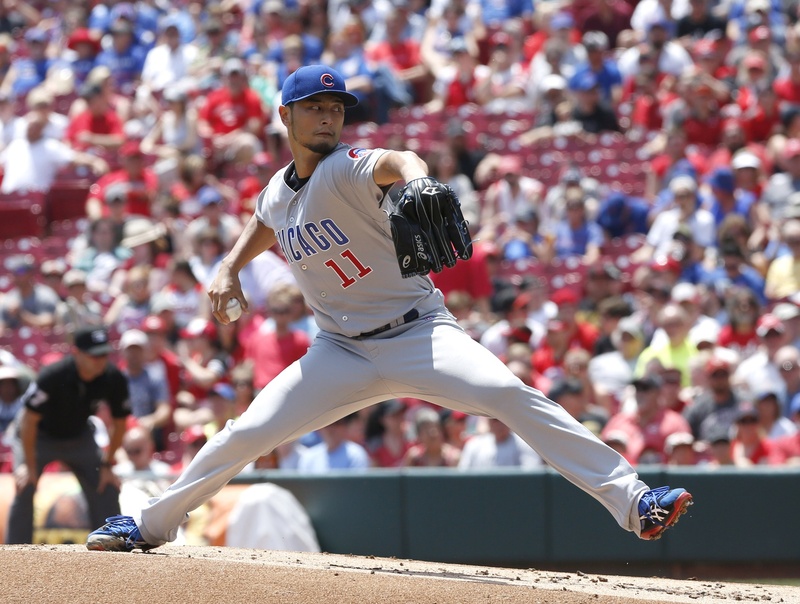 After maybe the most frustrating game of the year Saturday morning, Quintana and Darvish turned into the best versions of themselves and made it a successful series in Cincinnati. Next level: This might be the first time all year we’ve seen Yu get shaky and then fix himself, and he did it a couple times. Darvish opened by walking something called a Blandino — which is Italian for “boring baseball player” — and after a Joey Votto single, a Scooter Gennett two-strike HBP, and a weak infield single by Scott Schebler, it was 1-0 and very scary. Yu is a tough pitcher to catch, but Willson was stabbing all over the place in the first, probably helping to cost him a few crucial strikes (catchers shouldn’t have to put on a play for umpires to correctly do their job, but that’s for another time). Pitch 39 got Tucker Barnhart to pop out, and apparently the inning took so long, Mahle forgot how to pitch, and the Cubs put up a three spot. With the lead, Darvish was more comfortable, but in the fourth, he got into trouble. The horrific strike zone of John Tumpane didn’t help, but Yu walked Schebler, then threatened to turn into bad/emotional Darvish when he walked the pitcher, Mahle, on four straight. What happened next seemed important: Darvish stepped completely off the mound and took a break to recalibrate. Rizzo did his best Jim Hickey impression, making an official visit to the mound from first base, and Yu got right out of it. Granted, it helped that Billy Hamilton did the most Billy Hamilton thing possible and swung at the first pitch after the pitcher walked, but Yu at least had to make the pitch reachable for Hamilton to bail him out. After that, he was great, sailing into the sixth and finishing with a 1-2-3 inning and back-to-back strikeouts. Theo Epstein has called Darvish “the preeminent strikeout pitcher of our generation,” but when he isn’t missing bats, he isn’t very good. A great sign here: he wasn’t missing bats early, but he was able to stay around the strike zone enough to stay effective until he got his command back. A better sign: he fought through early adversity, another significant jam, and a completely random strike zone without letting it all get away from him. Darvish’s final line: 6 IP, 2 hits, 1 ER, 3 walks, 7 strikeouts. Oh, and a win. More of that, please. Kevin is a comedian & TV person originally from Chicago, now living in NYC. He has appeared on Letterman, various truTV shows, and sobbing at Wrigley during Kerry Wood's last appearance.